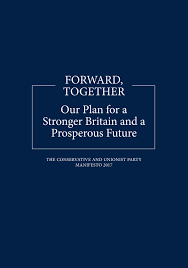 In contrast to the U.K. Labour Party's progressive blueprint, Prime Minister Theresa May unveiled the Conservative Party's election manifesto on Thursday, sparking a wave of backlash over a pledge to create a new internet that would let the government control what gets posted online. "Some people say that it is not for government to regulate when it comes to technology and internet," the manifesto states. "We disagree." It continues that it wants the U.K. to become "the global leader in the regulation of the use of personal data and the internet." Senior Tories confirmed to Buzzfeed News that means the party wants to impose strict rules on what people can write or share on the internet and social media, and require internet companies to go along with the government's so-called counter-terrorism programs or face repercussions. In particular, the Tories said, Conservatives would seek to rein in the growing power of Facebook and Google, which have historically resisted calls to share information with the government—something May's party found out when it attempted to get WhatsApp to decrypt data after an attack on the U.K. Parliament in March, Buzzfeed noted. Indeed, the pledge comes just months after May approved the Investigatory Powers Bill, introducing what transparency advocates called the most extreme surveillance law ever passed by a democracy. The legislation requires internet companies to keep diligent records of customers' browsing histories and forces apps to give the government a backdoor to their encrypted messaging services. The new rules would also give the government unprecedented power in deciding what kind of content can be accessed online and would require internet companies to pay fees—like those currently imposed on gambling firms—that would fund advertisements warning users about the dangers of the internet. The pledge also states that May would "take steps to protect the reliability and objectivity of information that is essential to our democracy" and crack down on companies to make sure that news outlets get enough advertising money. If the companies resist, the manifesto promises to punish them. "We will introduce a sanctions regime to ensure compliance, giving regulators the ability to fine or prosecute those companies that fail in their legal duties, and to order the removal of content where it clearly breaches U.K. law," it reads. Jim Killock, who runs the U.K.-based privacy advocacy organization Open Rights Group, told Buzzfeed that the rules would impose strict penalties on social media platforms for little benefit, considering that companies like Facebook are already more restrictive than the law. "It's hard to see what really is going to be added by this except enormous costs for little benefit," Killock said. Facebook "won't get it right—they'll behave in a risk-averse fashion," he said. "They'll censor more than they need to. I do not want Mark Zuckerberg to think of himself as judge and jury of what people can say in Britain." The rest of the manifesto did not bode much better, with vows to reduce immigration numbers, introduce a "meritocracy" into British society, deliver a swift Brexit, and force voters to present identification in order to cast a ballot—a controversial provision that has been slapped down throughout the U.S. as unconstitutional and racist. The ID rule could prevent an estimated 3.5 million people from voting, the Electoral Commission said. Elsewhere, the manifesto proposes taxing home care for the elderly by counting it as part of their assets. Labour leader Jeremy Corbyn—whose party's manifesto was well-received last week—slammed the proposal as a "tax on dementia."